Rewards Canada: October 20 Update: Transfer Aeroplan Miles for 1.5 cents, Save up to 30% on Fairmont stays, lots of global bonuses! October 20 Update: Transfer Aeroplan Miles for 1.5 cents, Save up to 30% on Fairmont stays, lots of global bonuses! Aeroplan has lowered the price for transferring miles until November 1st. The usual price is 2 cents per mile but right now you can transfer for 1.5 cents per mile. Not a great deal either way but if someone you know may be shy 5,000 or 10,000 miles of a very valuable award it can be worth it to transfer miles over. Just do you math before hand if you are thinking about transferring miles. Find out more here. In case voting yesterday in the election wasn't enough for you, you can vote for your favourite travel rewards credit card! Over 5,000 people have voted and we would love to hear from you if you haven't voted yet. Vote here! 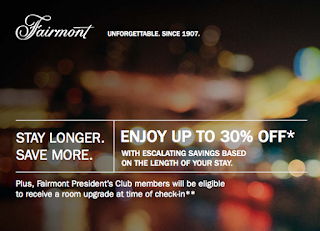 Fairmont Hotel's Moments offer has been updated again. You can enjoy up to 30% off stays and if your are a Fairmont President's Club member you'll get a room upgrade (based on availability of course!) Find out more here.